I have had bad luck with citrusy-rose fragrances, notably with Hermes Eau de Pamplemousse Rose (yes, I know that’s really “Pink Grapefruit,” but there’s rose in there all the same), Cerruti 1881, Yuzu Rouge, Parfums de Rosine Zeste de Rose, and Clarins Par Amour Toujours. So I was hesitant to try Funny!, which Tania Sanchez Luca Turin (why do I keep ascribing these quotes incorrectly? do I have a mental block or something? also, the book is right there, easily consulted. Thanks, Elisa) describes in P:TG as being mostly tea, rose, and grapefruit. But a couple of manufacturer’s samples of Funny! came my way in a sample swap, and I figured what the heck, I might as well watch this one crash and burn along with the other citrus-rose scents. I tried Funny! one steamy summer morning when we were driving home from a visit to my sister-in-law in Northern Virginia (which is the Unintentional Outdoor Sauna Capital of the US, in my opinion, beating out even the extra-humid summer air of Florida). Much to my surprise, it was nice. And it stayed nice for hours. I shrugged and put the sample vial in the Limbo pile when I got home, still of the opinion that I did not need a citrusy floral. A few weeks later I found myself thinking about it, so I got it out again and used it up. It continued playing nice in muggy weather. I got out the other swap sample and took it with me on vacation last July to South Carolina, another state famous for its heat and humidity, and Funny not only lasted but kept me cool and relatively cheerful during the week long trip. It’s funny (no, really) that I kept trying it, and saying “nice, but I don’t need any,” and “nice, but I don’t get the four-star review,” and “nice, but not exceptional,” and kept thinking about it until it won me over. At that point I finally decided that I did indeed want a bottle, so I watched eBay and checked the online discounters, and finally, last fall, found a 50ml bottle for about $19. Whatta bargain, whatta bargain for me!! I have been using it to good effect already this summer. The notes for Funny!, according to Fragrantica, are redcurrant, pink pepper, orange, peony, jasmine, violet, green tea, cedar, amber, musk. I notice that rose and grapefruit are not on the official list, but I’ll tell you I’m fairly certain that rose is present. I suppose the orange note with the tang of currant and pink pepper could impersonate grapefruit, though I really don’t care what exactly causes the effect because it just smells good – fresh and bright and happy, in a way unlike the usual clenched-teeth grin effect I get out of the usual citrus notes. Funny! does open up with that tangy-bitter citrus I just mentioned, and although it doesn’t have the holographic immediacy of the grapefruit in Guerlain’s (wonderful) grapefruit-bomb Pamplelune, it is very pleasant. Also, this bitter citrus note lasts about twenty minutes on me, which is a pretty good long run for a citrus note on my skin, before the florals come up underneath it. I can’t pick out the violet, but the typically-neon peony note is soft here and combines with the rose and jasmine to create a transparent glow. The effect is like sunshine glowing through pink gauze curtains over beach cottage windows open to the breeze. The green tea note (familiar from the ubiquitous Bvlgari Au Te Verte, which fell very flat and heavy on my skin) is discernible too. There is an airy spaciousness to Funny!, and I especially love wearing it in muggy weather, when it seems to clear the air for a little bubble of freshness around me. The basenotes are muted, but the cedar is almost astringent in its dryness, and if you are very sensitive to the “hamster cage” cedar effect you might have trouble with this scent. I like it. Sillage is mild unless I employ the Spray-until-wet technique, in which case it’s moderate. Like most eaux des toilettes and other light scents, it doesn’t last all that long, but it does stick around for about three hours with a normal quick spritz, and for nearly five hours with the Spray-until-wet, which is stunning longevity for me personally. Funny!, which was released in 2007, is available, as I mentioned above, at online discounters at a very good price, with various bath and body products (bath gel, lotion) available as well. 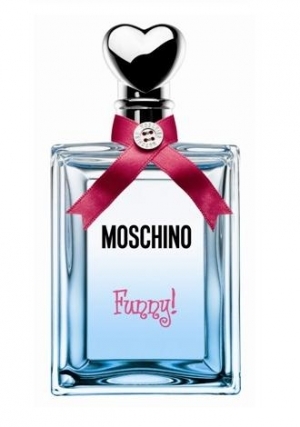 The bottle, by the way, is on the plain side, a pale turquoise blue glass rectangle with a raised frame on the front and a silver puffed-heart cap, but I think it’s nicer than Moschino’s plastic Olive Oyl bottles. I ditched the pink ribbon collar right away because it kept coming off when I took off the cap, so now the bottle is less interesting to look at but easier to use. “Ease of Use” and “Feels Nice in the Hand” being my top bottle preferences, I’m satisfied. I like a pretty bottle, but it’s not necessary to my overall enjoyment of fragrance. Only one other blog review that I could find: Brian at ISTIA. Reviews at the fragrance forums tend to say things like, “Smells like Light Blue, but nicer,” and “Young, cheerful, flirty.” I don’t know about Funny!’s flirtation factor, but I will admit that it is somewhat in the Light Blue vein, but more natural-smelling, far less alien-metallic baby-wipe citrus, and also that it is definitely one of the most cheerful and airy scents I’ve ever smelled. I always spray myself wet with this one and then I get a good 6 hours or so out of it. I have never really apprehended the tea notes — to me it just smells like grapefruit, currant and peony (and that’s fine by me — I usually think green tea scents smell like soap). Teensy quibble: It was actually Luca who reviewed this one. That barbershop quartet bit is memorable. Six hours would be good. Six hours is the average length of some strapping big-boned oriental edp on my scent-eating skin. And I don’t like green tea scents much either. Though I don’t think it’s the tea, per se. Usually that’s all mugged up with lemon or something “fresh” and I hate it, or after the lemony weak tea the scent goes all Fake-Jasmine Yawny. Bleargh. I can get almost anything to last six hours by adjusting up the sprays. My coworkers must LOVE ME! You inspired me to put on some Funny as my SOTE. Mm, mm, good! If you can get En Passant or Osmanthe Yunnan to last six hours with extra sprays (and not using the whole bottle), I will bow to you as the Queen of Extra Sprays. But your Funny! smells good. Yeah, probably “almost anything” doesn’t include Giacobetti or Ellena scents. Philosykos is one that I don’t bother wearing to work because it’s gone by the time I get there. Philosykos is a weekend brunch scent. Sounds like something I might like! I don’t think I’ve seen this one in the stores, but may look a bit on ebay if it’s that cheap. And yes, the DC area (spent 26 years in MD til I moved out here to SD) is an absolute swamp in the summertime. Not one of the things I miss (although I greatly miss summer thunderstorms and fireflies). Funny! is a great deal and worth smelling. Nice review on the Funny. It sounds kind of familiar to me, drifting in the back of my consciousness, like I might have smelled it once a long time ago and liked it but didn’t do anything about it at the time. And then promptly forgot about it. Will have to look it up. Same thing with the Cheap n’ Chic that you reviewed the other day. Will definitely have to poke around to see where I can try it. Thanks, Ann. I never know where something can be tried in person, because I just don’t have access to anything more than the most mainstream and common of fragrances (and then, only when I drive 20 miles). Ebay has samples and minis, I know. Yes, the Ferre 20 is great! I still like it. I’ve been wasting my time with unworthy samples instead of wearing it… I don’t know where you could sample, unless with TPC – I think it’s D/C, at least in the US. It’s actually been a little cooler here this week (high 70s, low 80s, as compared to last week’s 96F) so I’m FINE. I like this kind of weather.